Figure 1: Krypton wins over curium. Figure 2: The final results of the March Matter Madness Twitter Event. I certainly made sure to recognize the elements that made it to the Sweet 16, the Elite 8, and the Final 4. Perhaps one or more of your favorite elements earned on of these honors (Table 1). Table 1: Elements reaching the Sweet 16, Elite 8, Final 4, the Finals, and the overall Champion in the March Matter Madness Twitter Event. It was fun to note that certain elements such as Li, Na, K, Rb, Cs, and Fr belonged to the same "conference", or to report the results of certain matchups using a bit of chemical color (Ag "outshined" Au 62-38, or Ne "lit up" Rn, 70-30 in a matchup from the noble gas conference). It appears that some teachers and their students got in on the fun, and this got me to wondering if such a “periodic table playoff” would be something that teachers might try in their classrooms. I think it would be an interesting and perhaps even an educational exercise for students to run a playoff between 16, 32, 64, or even all 118 elements. Students could decide and announce which elements were included in, for example, a 64 team tournament in a "selection show". Further, other methods of seeding could be used. For instance, instead of seeding elements based on atomic number, the elements could be seeded on the basis of electronegativity, density, atomic radius, or a host of other properties. Also, prior to voting in a poll, students could provide reasons why they think a certain element in a given matchup is better. Apparently, this is what students in Ali Martinez’s (@dmartinezLFU) class did. Below you can find links to download the Excel file I used to keep track of the tournament (with elements seeded according to atomic number) if you wish to try this in your classes. I also included an Excel file that displays the results of every matchup between the elements during #MarchMatterMadness. If any of you do conduct a periodic table playoff in your classroom, please drop me a line and let me know how it works out. I would request that if you run an element tournament in your classroom, please let me in on the voting. 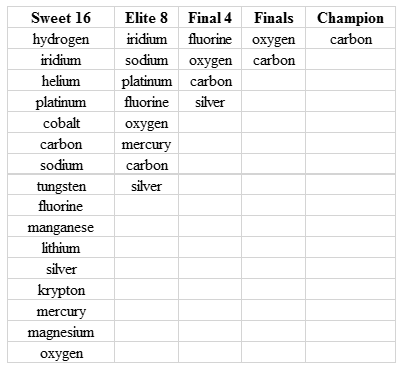 I’m still a little upset that my favorite element, hydrogen (which was the number one overall seed), didn’t make it past the Sweet 16 during #MarchMatterMadness L.